I just released my first PdF Pattern in Etsy "The family passport Wallet". 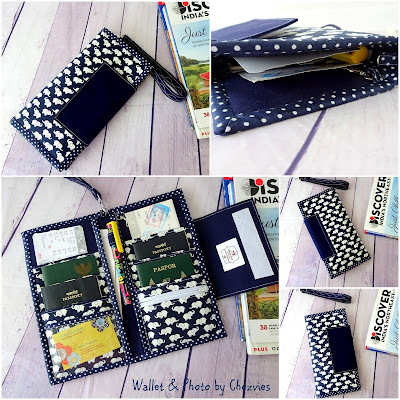 I made my first Family Passport Wallet 2013 and it was an instant hit in my Etsy shop. The wallet has been going through a lot of redesign. It's my friend Namrata of Bagstock who encouraged me to write the pattern. and yes, I was nervous and excited. I will post here in my blog if there is any changes or updates or what improvisation you can do with the pattern. And this first post is about the lanyard. I did not include the lanyard tutorial in my pattern as nowadays many people prefer to use leather strap which is really cute and can give a vintage-y look about your wallet. I did few for my etsy customers and they loved it. Iron the woven interfacing on the wrong side of the fabric strip. I have this 1.5" woven interfacing strips which I simply LOVE. It's my favorite for making bag handles/strap. There is a 3/4" one too. and you can use your decorative stitch too. That will make your strap unique. I love using different kind of decorative stitch but this serpentine is my favorite. Now, finish your lanyard by sewing 1/2" under the hook. Voila! You have a pretty handmade lanyard to go with your passport wallet.